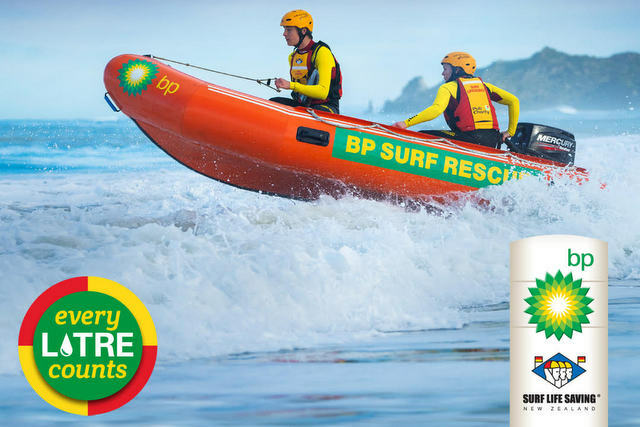 BP is back supporting Surf Life Saving NZ with their Every Litre Counts initiative. This was an incredibly successful promotion last summer - $459,000 was generated – and BP have decided to run it again. What this means … from Monday 21 January to Sunday 17 February, for every litre of fuel sold at BP retail outlets, BP will make a donation to SLSNZ. This donation is crucial as it helps to keep the organisation and its affiliated surf clubs ticking over. The more that friends and family can be encouraged to fuel up at BP over this period, the bigger the donation! Show your support for SLSNZ and head to BP to fuel up! The more people that fuel up at BP during this period, the more money that will be donated by BP … and the more money received by SLSNZ, the bigger the allocation of money to the surf clubs. The conservative target for funds is $200K from this campaign with $50K directly available to clubs through a video incentive. However, if a larger amount is raised e.g. $300K, SLSNZ will distribute an additional $100K to the clubs. The current thinking by SLSNZ is to invest the additional funds (hopefully $100K+) into providing some form of subsidy/grant for first aid training/supplies for club lifeguards. This ties in with BP’s mantra of Safety First and will no doubt benefit the volunteer lifeguards and clubs by minimising their costs. The association began shortly after the 1968 Wahine disaster. Prior to that, Europa, subsequently purchased by BP, sponsored a surf boat at Worser Bay Surf Life Saving Club called Miss Europa. This boat was used by brave clubbies in horrendous conditions to save some of the 683 passengers and crew that were rescued from the Wahine. The Europa staff were so impressed by the actions of these clubbies that a nationwide sponsorship began shortly after this. The partnership has evolved over the past 51 years and has seen many changes in both surf lifesaving and sport. During this time, surf lifeguards have saved more than 55,000 lives and more than 22,000 of those have been rescued using an IRB (inflatable rescue boat). That’s something both organisations are incredibly proud of – all 74 Surf Life Saving Clubs and all their members should be too!